Feral Hogs get a bad rap. It’s a reputation that is not entirely deserved. Feral Hogs are considered an invasive species. As the name implies, these animals are descendants of domesticated pigs that were deliberately released or allowed to escape. 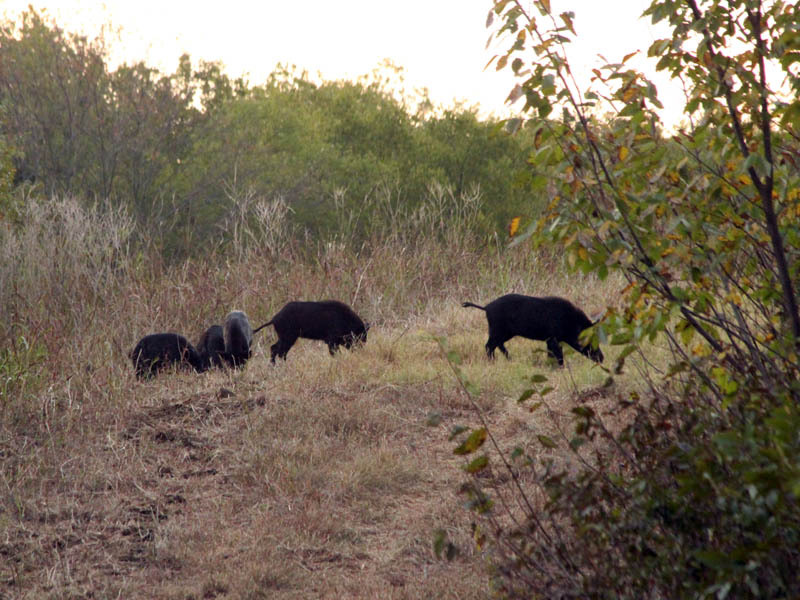 Like so many of our environmental issues, the Feral Hog problem is entirely man-made. 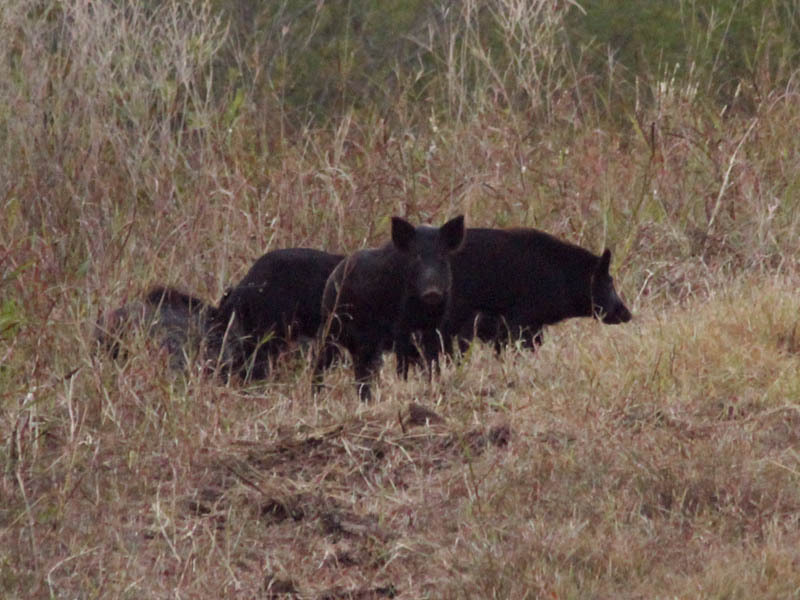 Many different claims are made about the evils of Feral Hogs. People say they are extremely destructive, and that they carry disease. They are reported to be vicious predators who ravage native wildlife populations. It is said that they breed prodigiously, and that they have no natural predators. Warnings are given that wild pigs are extremely aggressive. I’ve heard it claimed that if Feral Hogs get you on the ground that they will eat you alive. Of course all of these claims are exaggerated. Hogs spend much of their time rooting in soft soil. They do this in their never ending search for food. Mussels, grubs, tubers, and other buried food stuffs are what they are after. Pigs also enjoy a good wallow in the mud. Bathing in mud is a techniques these and other animals used to cool off and to protect themselves from biting insects. Both of these activities can turn over larges swaths of soil. If you are a farmer or if you own a golf course, then Feral Hogs engaging in rooting or wallowing can do serious damage to your property. 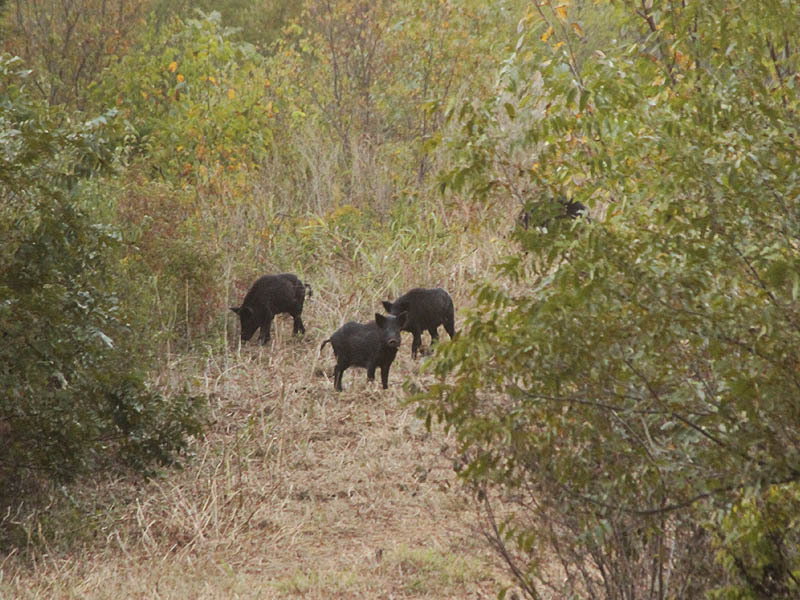 But in wild spaces like the Trinity River bottoms the “damage” done by rooting hogs is quickly erased by natural processes. Feral Hogs have much less of an environmental impact on the land than a similarly sized herd of cattle. A lone 4×4 truck going off road can cause much more damage in a single afternoon than a whole sounder of hogs can do in months or years. Feral Hogs are omnivores. They feed on both plants and animals. Though vegetable matter is the most readily available food source for wild pigs (composing around 90% of their diet), they are opportunistic and will feed on animals when given the chance. In their foraging it is certain that they come across the eggs and young of ground nesting birds, mammals, and reptiles. In these cases there is no doubt that the hogs will consume the eggs or the young. It is even said the Feral Hogs will feed on small juvenile deer if they are discovered. 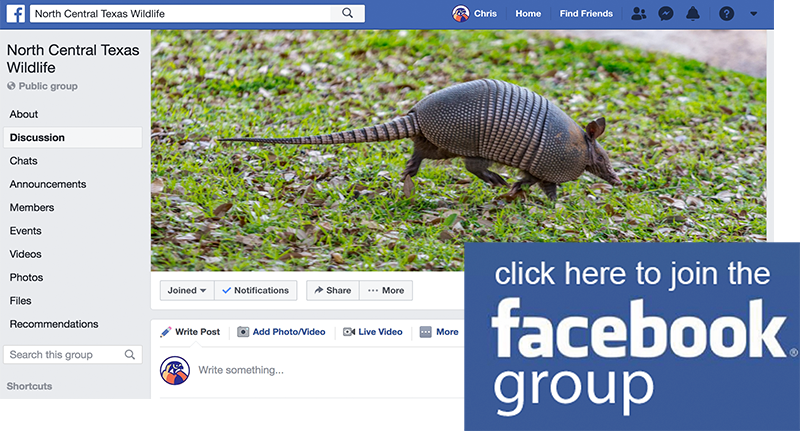 When it comes to the impact of Feral Hogs, this kind of predation is of major concern for conservationists and sportsmen. The worry is that the pigs have the potential to decimate the population of native game animals and other rare or endangered species. This is a legitimate concern, of course, but the real impact is difficult to quantify. I have witnessed Feral Hogs mingling in with great flocks of wading birds such as egrets and herons without either party giving the other much notice—even at close range. At that time I wondered to myself what the reaction of the birds would have been if I had tried to walk through their midst they way the hogs had. The birds certainly would have taken flight before I ever even got close—this despite the fact that I am unquestionably NOT a vicious predator. It is interesting to note that the birds were not afraid of the pigs. Wild Hogs are very prolific breeders. Typical litters average between 5 and 6 piglets (maximum 14), and multiple litters are possible each year. No other large mammal breeds in these numbers. Indeed their reproduction rate is a key factor in their success as a wild animal. This astonishing reproductive rate is also instructive when examining the claim that Feral Hogs have no natural predators. 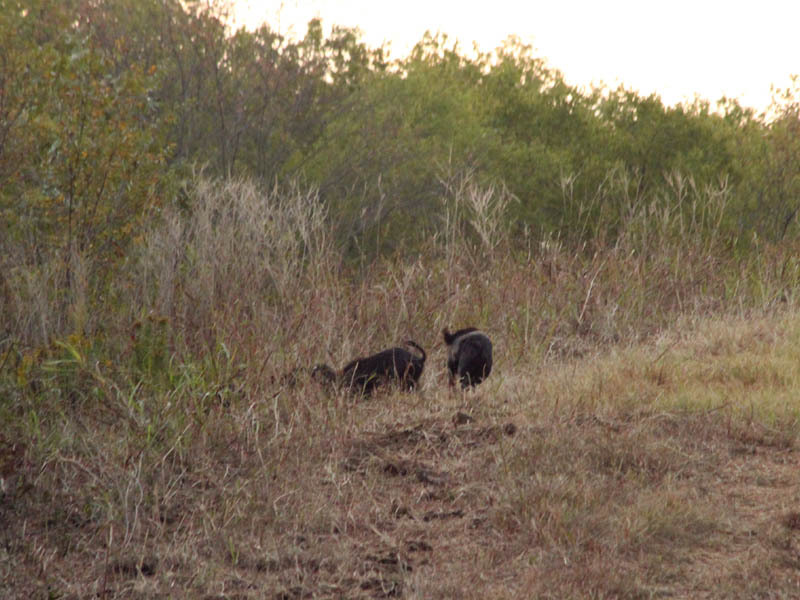 Without some mechanism for diminishing their numbers wild pigs would quickly overpopulate any parcel of land on which they reside. While it is easy to imagine the difficulty a Coyote or Bobcat might have taking down a full grown pig, the same is not so true of the piglets. Sows give birth in a prepared nest and remain separated from the rest of the sounder for the first 4 to 6 days of their piglet’s life. During this time the young are very vulnerable to predation, and an overwhelmed sow can lose several of her brood to determined predators. 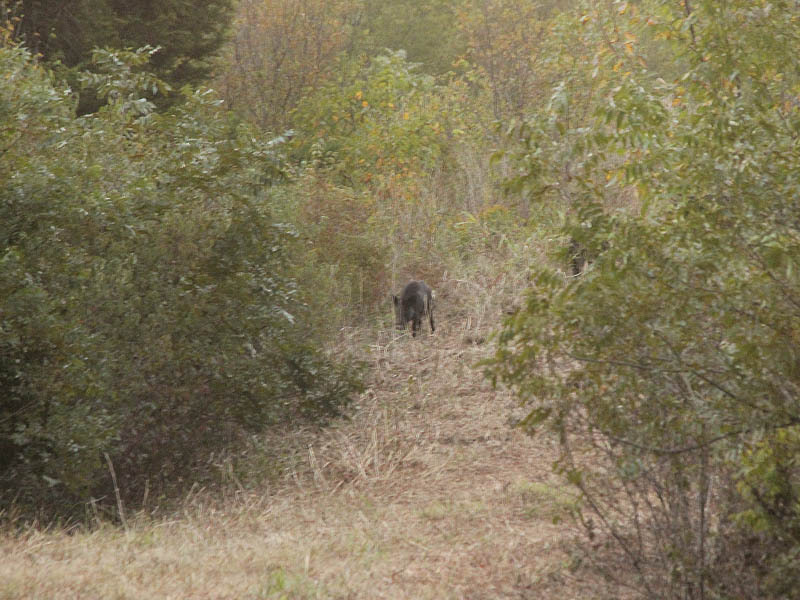 We spotted our first hog of the day early on. 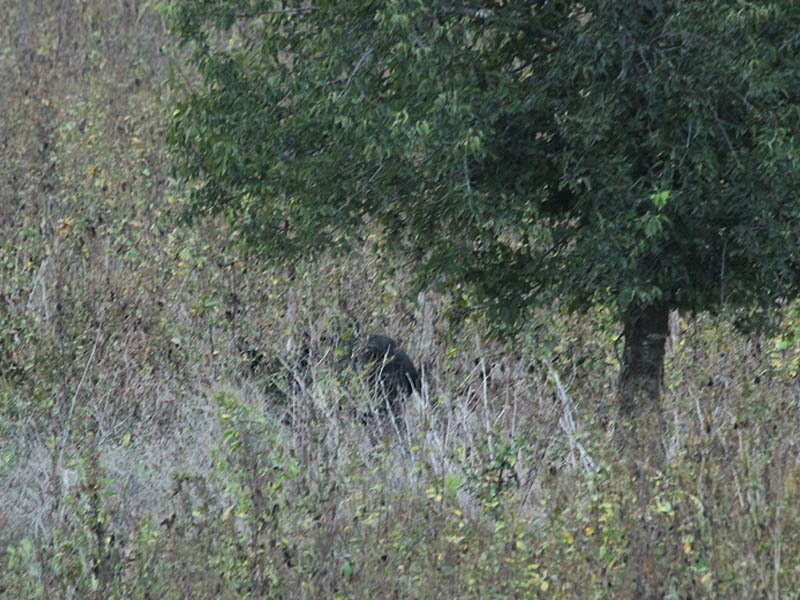 We just got a glimpse of this large boar under a tree in the middle of an expansive open field. 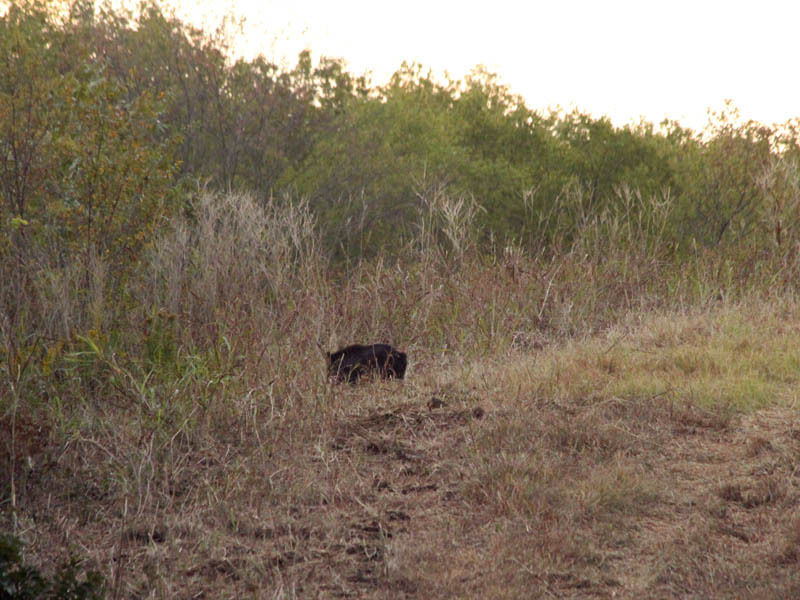 This hog’s senses were on high alert, exposed as he was in the grassland below the levee. He was alerted to our presence while we were still 100 or more yards away, and he beat a hasty retreat. The picture below is the best look we had of him. 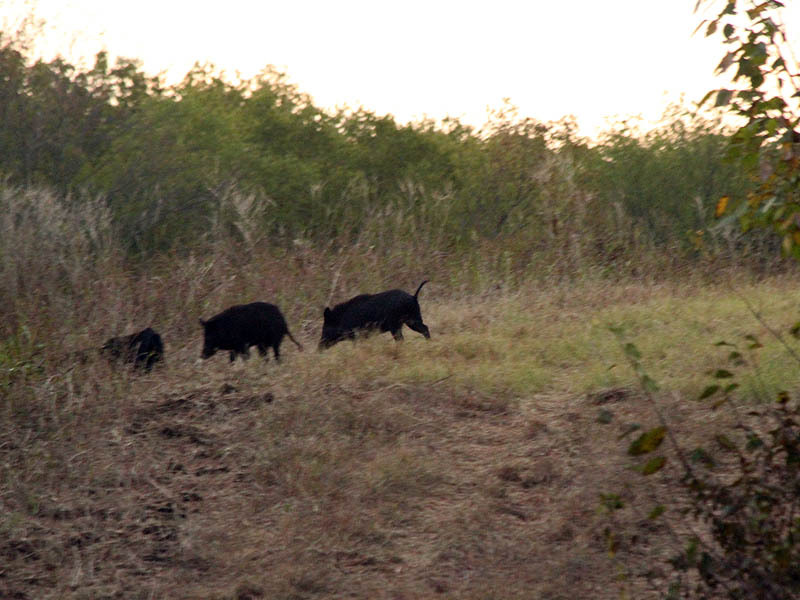 Later that morning we encountered a small sounder of hogs on the Trinity River levee. The entire group was busy foraging by the trailside, and they were so preoccupied with their business that they did not notice us at first. We stood observing out in the open and less than fifty yards away. We were conversing the entire time. Eventually the hogs did notice us, and when they did they fled. Calmly and in single file they trundled down the side of the levee and into the safety of the bottomland woods near the river. Feral Hogs are large powerful animals. They have sharp tusks and can defend themselves if pressed. If taunted or surprised they are likely to respond. If a sow feels her piglets are threatened she will surely move to protect them. But in my experience, Feral Hogs will always retreat or allow you to retreat as their first, best option. Like all of our local wildlife Feral Hogs deserve respect, but they need not be feared.